[ABOVE] Two portraits photographed at the "Sticky Backs" studio at 54 North Street, Brighton. (c1910). The photographer and mechanical inventor Spiridione Grossi operated the studio at 54 North Street, Brighton for a brief period between 1910 and 1911. 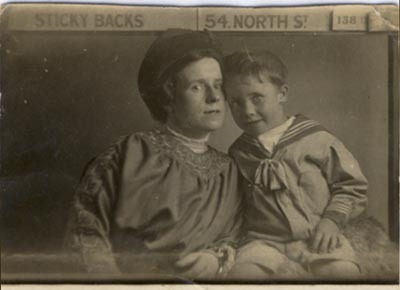 "Sticky Backs" were small photographs with adhesive backs. [ABOVE] Another portrait from Photo Strip No. 138 . This time, the boy, previously pictured with his mother in the photograph at the top of this column, is photographed on his own. The photograph carries the studio address of 54 North Street and the identifying number 138. Six photographic portraits were produced side-by-side on a single strip of photo-paper. [ABOVE] Spiridione Grossi listed as a photographer at 54 North Street, Brighton in the 1911 edition of Kelly's Directory of Sussex. The same Brighton directory lists Charles John Reed, an engineer, at 58 Prudential Buildings, North Street, Brighton [SEE BELOW]. A man named Charles John Reed owned the "Sticky-Backs" photography business in January 1911. Spiridione Grossi (1877-1921) operated a photographic portrait studio at 54 North Street, Brighton between 1910 and 1911. Spiro Grossi's studio at 54 North Street also went under the name of The Sticky Back & Post Card Studio. At this time, photographic portraits printed on cards measuring approximately 51/2 "x 31/2", specifically designed to be sent through the post, were becoming increasingly popular. (Picture postcards with divided backs, allowing space for a postal address and a written message, were not authorised by the Post Master General until 1902. An official report from The Post Office estimated that around 190 million picture postcards were posted in the year ending March,1910). 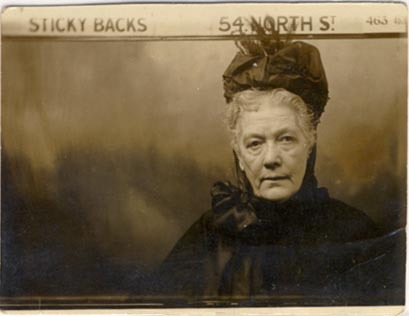 By 1911, Grossi's studio was also producing tiny photographic portraits called "Sticky Backs". As a photo magazine explained in 1912, "A Stickyback Photograph is one that has adhesive matter spread on the back, which it is simply necessary to moisten and then stick the picture on the mount. 'Stickyback' is the name by which small gummed-photographs, not much larger than a postage-stamp, are known." [Photo-era Magazine, Vol.28, 1912]. The "Sticky Back" photographs produced at Spiridione Grossi's studio in North Street measured roughly 2 inches by 1 1/2 inches. What made Grossi's tiny "sticky back" portraits distinctive were that they were created mechanically on a strip of photo-paper that could hold up to six individual portraits. In general appearance, the small photographic portraits made at Grossi's Sticky Backs studio resemble the photographs produced by modern-day automatic photo-booths, but although the strip photographs were created with the aid of a mechanical device invented by Spiridione Grossi, the camera at the North Street studio was operated by a human photographer and not an automatic machine triggered by a coin in a slot. Spiridione Nicolo Grossi, an innovative photographer and mechanical inventor, was born in Liverpool during the First Quarter of 1877, the eldest surviving son of Margaret Hearne and John Baptiste Grossi (c1836-1895), an "outfitter" and former photographer of Paradise Street, Liverpool. John Baptiste Grossi, Spiridione Grossi's father, was born in Austria around 1836. By the mid-1860s, John Baptiste Grossi was working as a professional photographer in Liverpool. A trade directory published in 1867 lists John B. Grossi as a photographer at 27 Paradise Street, Liverpool. In 1874, John Baptiste Grossi married Margaret Hearne (born 1854, Liverpool), the eldest daughter of an Irish widow named Mrs Hannah Hearne (born c1822, Ireland). John and Margaret Grossi produced a number of children, six of whom survived infancy and reached adulthood - Spiridione Nicolo Grossi (born 1877), Annetta Grossi (born c1878) - also known as "Cissie", George Frederick Grossi (born 1882), Stella Marguerite Grossi (born 1883), Bianca Virginia Grossi (born 1887) and Carmen Valeria Grossi (born 1888), also known as "Camelia". Both Spiridione Grossi and his younger sister Stella Marguerite Grossi went on to become professional photographers like their father before them. In the 1901 census, Spiro Grossi, is recorded as a twenty-four year old "Photographic Printer" in the city of Liverpool. Mrs Margaret Grossi, Spiridione Grossi's widowed mother, is described on the 1901 census return as an "Ex School Mistress". Spiro Grossi's teenage brother George Grossi was working as a ship's steward and two of his sisters, twenty-three year old Cissie and seventeen year old Stella, were both employed as typists. By 1907, Spiridione Grossi had opened his own photographic portrait studio in Liverpool. Trade directories published in 1907 and 1908, record Spiridione Grossi as a photographer at 107a Bold Street, Liverpool. Grossi then moved to Manchester, where he operated two photographic studios, one at 5 Marsden Square, the other at 84 Market Street. Trade directories published between 1909 and 1911, list Spiridione Grossi as the proprietor of studios at 5 Marsden Square, Manchester and 84 Market Street, Manchester. Photographs held by the Greater Manchester County Record Office show that Grossi's business premises at 84 Market Street, Manchester, went under the name of The Post Card Studio. Grossi's establishments in Manchester mainly produced studio portraits in the popular postcard format, yet one example in the Greater Manchester archive ("Kate on prize-giving day at Southall Street School" produced by The Post Card Studio, 84 Market Street, Manchester) indicates that Spiridione Grossi did some photographic work away from the confines of his studio premises. In addition to being a photographer, Spiridione Grossi was an inventor and around 1910 he had devised a mechanical means of producing small photographic portraits on a strip of photographic paper. The reverse of the photographs were coated with a gum, which made the pictures adhesive when moistened. These small self-adhesive photographs became known as "Sticky Backs". Grossi's innovation seems to have attracted the interest of Wallace Edward Allan and Charles John Stewart Reed. Wallace Allan and Charles Reed joined forces to form a photographic business called "Sticky-Backs" which operated from 54 Market Street, Manchester, a short distance from Grossi's studio at 84 Market Street, Manchester. The business partnership between Wallace Allan and Charles John Reed was dissolved in January 1911. Wallace Allan continued working as a photographer at 54 Market Street, Manchester under his own name, but, according to The British Journal of Photography, Allan's former business partner Charles John Reed carried on the Sticky-Backs business "on his own account". Slater's Manchester Directory of 1911 lists Wallace Allan as a photographer at 54 Market Street, Manchester, but neither Spiridione Grossi nor Charles John Reed feature in Slater's 1911 directory. Spiridione Grossi next appears as a photographer in Kelly's Directory of Sussex, published in 1911. Kelly's 1911 trade directory of Brighton, records Spiridione Grossi as a photographer at 54 North Street, Brighton. Interestingly, an electrical engineer named Charles John Reed is listed in the same Brighton directory at 58 Prudential Buildings, North Street, Brighton. Could this be the same Charles John Reed who took control of the Sticky-Backs photography business in January 1911? Charles John Reed, the Brighton engineer, was born in Brighton in 1865. In the 1901 census, Charles John Reed is described as a thirty-five year old engineer. The 1911 census records Charles John Reed, a forty-five year old "Engineer", residing at 58 Prudential Buildings, North Street, Brighton with his two sons, Philip Charles Reed (born 1906) and John Patrick Reed (born 1909). [ABOVE] A legal notice announcing the dissolution of the business partnership between Charles John Stewart Reed and Wallace Edward Allan, who had been operating a photographic studio at 54 Market Street, Manchester under the name of "Sticky-Backs". This notice appeared in The British Journal of Photography on 13th January, 1911. [ABOVE] A legal notice, dated 30th December 1912, giving details of the liquidation of the photographic company known as the Sticky Backs Photo Syndicate Limited (The London Gazette, 3rd January 1913) The connection between the Sticky Back photographic company, photographer Spiridione Grossi and Charles John Reed, the Brighton engineer, is circumstantial. In 1910, Grossi was working as a photographer at 84 Market Street, Manchester and Charles John Reed was the co-owner of the Sticky-Backs photographic studio at 54 Market Street, Manchester. By 1911, Spiridione Grossi was operating the Sticky Backs Photo Studio at 54 North Street, Brighton and Charles John Reed was residing in the same street at 58 Prudential Buildings. In January 1911, a man named Charles John Stewart Reed was recorded as the sole owner of the Sticky-Backs photographic firm. Within a few years there were a number of photographic portrait studios carrying the trade name of "Sticky Backs" or "Sticky-Back". STICKY BACKS PHOTO. CO. LTD. - This company was registered with a capital of �1,000 in �1 shares. Objects, to take over the business of photographers carried on by E. S. Perry and D. R. Blair, at 4A, Acre Lane, Brixton. First directors, D. R. Blair, E. S. Perry, and L. F. Pugh. Registered office, 4A Acre Lane, Brixton, S.W. Private company. In 1911, The Board of Trade had a record of a company known as Sticky Backs Photo Syndicate Ltd (Company Registration No. 118170). According to a notice in The London Gazette, dated 30th December 1912, the Sticky Backs Photo Syndicate Ltd was dissolved within a year or so. A photographer named Knight (either H. C. Knight or C. H. Knight) operated the Original Sticky Backs photographic studio at 69 Wellington Street, Woolwich from around 1914 until 1920. A photographer working under the trade name of Mr Stickyback was producing photographic portraits on post cards at 36 Yorkshire Street, Rochdale in 1916. Mr Stickyback studios were also recorded in Birmingham, Leicester, Dublin and Glasgow. [ABOVE] The title that appeared on the "sticky back" portraits photographed at Spiridione Grossi's studio at 54 North Street, Brighton. Grossi explained in a later patent application for "improvements in strip printing", that his camera contained a "special fixed negative giving the name and address of the photographer"
Spiridione Grossi operated the photographic portrait studio at 54 North Street, Brighton for a short period between 1910 and 1911.Spiridione Grossi is listed as a photographer at 54 North Street in Kelly's Directory of Brighton, Hove and Preston, Kelly's Sussex Directory and the 1911 edition of W. T. Pike's Brighton and Hove Directory. However, when the census was taken on 2nd April 1911, Spiridione Grossi was residing in London, recorded as a patient of Dr Michael Longinotto at 10 Russell Square, London. Spiridione Grossi had devised an apparatus which took six small photographic portraits on a narrow strip of photo-paper. The backs of the small photographs were coated with a type of water-activated gum, similar to that used on postage stamps. These small adhesive photos, measuring approximately 2 inches by 1 1/2 inches. were generally known as "sticky-backs". 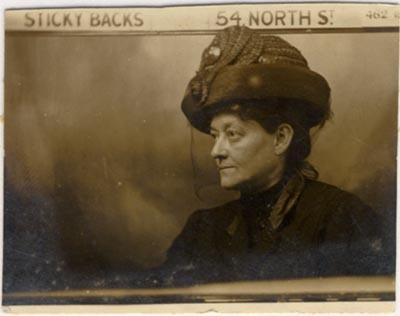 The studio name "Sticky Backs" often appeared as a printed title on the photographic prints produced at Grossi's establishment at 54 North Street, Brighton. We do not have a detailed description of the photographic equipment used at Spiridione Grossi's Brighton studio in 1910-1911, but we can gain an idea of the type of apparatus used to produce these narrow strip prints from an invention Spiridione Grossi lodged with the Patent Office on 15th May 1916. British Patent No. 108691, entitled "Improvements in Strip Printing Photographic Apparatus", describes a "travelling box", a mechanical contraption comprising of hinged flaps, a spring-roller, a winding cord, a manually operated pawl, a sprocket wheel, metal-bound spring boards, an "endless chain", a rotating drum and a set of retaining angle-pieces. According to the detailed descriptions and specifications of the "Strip Printing Photographic Apparatus" that Spiridione Grossi lodged with the Patent Office, his invention was designed to "produce, from cameras containing several negatives ... a large number of (photographic) repeats upon sensitive sheets of paper stacked in piles and arranged for intermittent feeding". [BELOW] A portrait of a girl photographed at the "Sticky Backs" studio at 54 North Street, Brighton (c1910). Each "sticky back" photograph carried the studio address of 54 North Street and an identifying number. This portrait carries Photo Number 391. Six photographic portraits were produced, one after the other, on a single strip of photo-paper. [ABOVE] A portrait of a girl photographed at the "Sticky Backs" studio at 54 North Street, Brighton . Photo No. 391 (c1910). The invention Spiridione Grossi lodged with the Patent Office on 15th May 1916 was designed specifically for "enlarging photographs", yet the contraption described as a "travelling box" or "sliding box" which produced "a number of photographs" on a single strip of photo-paper was probably similar to the photographic apparatus employed at Grossi's studio in Brighton's North Street, some five years earlier. In the provisional specification for his "Improvements in Strip Printing Photographic Apparatus" (British Patent No. 108691), Grossi wrote :" My camera takes six negatives side by side" and "a special fixed negative giving the name and address of the photographer is fixed in the camera ". Below the multi-negative camera was a "travelling" or "sliding" box, "carrying a series of piles of sensitive paper, in long lengths extending the entire length of the box"... These sheets are preferably of a length of four or five or six photographs and a breadth of one." Grossi goes on to describe the mechanism by which the photo-strips are passed through the "travelling box" : "This box in my experimental device is slid from left to right, being propelled by a blind roller device and stopped at the right point for taking a set of photographs by a spring friction pawl acting on a rack with notches at regular intervals ... When the photographs are sufficiently exposed, the operator pulls the cord, the spring pawls slip out of their notches and enter the next ones, and thus a second length of the sensitive papers is exposed to the camera, and this goes on until the entire length of the sensitive paper in the box has been exposed." The "travelling box" contained six piles of sensitive paper, each pile taking "about 150 papers to start with". Grossi's apparatus incorporated a mechanical system "whereby a large number of (photographic) repeats can be produced at once, and time in manipulation is greatly saved". The end result was a series of photographic portraits on a single strip of photographic paper, identified by a photo number and the name and address of the photographer's studio. 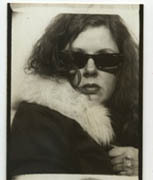 In appearance, the strip of photographic portraits produced at Grossi's Sticky Backs studio, strongly resembled modern photo booth photographs. However, the camera and "travelling box" were not operated automatically by some electrical machine triggered by the insertion of a coin. Grossi, in his descriptions of his "Strip Printing Photographic Apparatus" makes it clear that the equipment required the intervention of a human operator. Although some of the movements of the machine were automatic, at various stages of the process, the apparatus had to be "manually operated". For instance, the operator had to lift the pawl to "allow the box to travel one photograph length at each change of the position". The photographs themselves had to be exposed by the camera operator. The sliding shutter, which ran in a set of grooves, was "pulled out or pushed in by hand so as to expose or cover the sensitive paper". The sliding shutter was "pulled out by the left hand, while the right hand holds the blind-roller device". The human operator also had to pull a cord to enable the next length of sensitive paper to be exposed to the camera. In many ways, Spiridione Grossi's Strip Printing Photographic Apparatus of 1916 was a primitive precursor of the first truly automatic photo-booth introduced some eight years later in 1924. The first steps in automated photography had been taken in the year 1889, when Mathew Stiffens patented an "automatic photography machine" and Monsieur Ernest Enjalbert demonstrated his coin- operated, automatic tintype machine at the Exposition Universelle, the World's Fair which opened in Paris in May 1889. The automatic photographic machines invented by Mathew Stiffens and Ernest Enjalbert produced photographic portraits on a metal strip ( a ferrotype or "tintype"). Spiridione Grossi's photographic portraits were printed on narrow strips of photographic paper. The first coin-operated photo-booth, which produced several photographic portraits on a strips of photographic paper, opened to the public in New York City during the Summer of 1925. The inventor of the automatic photo booth, Anatol Marco Josepho (1894-1980) created a machine that produced a strip of 8 good quality photographic portraits in 8 minutes. [ABOVE] A portrait of a young girl, probably photographed at the "Sticky Backs" studio at 54 North Street, Brighton. 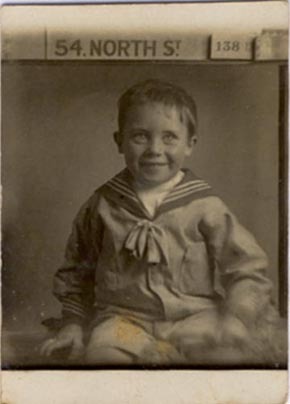 The studio address and photo number have been cropped from the photograph, but the general appearance of the photograph and the fact that this small portrait came from the same house clearance in Cheshire as the other "Sticky Backs" photos featured on this web page, suggests that this photo was also taken at Grossi's Brighton studio. 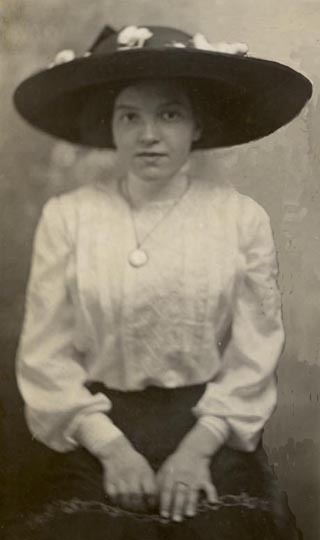 [ABOVE] A portrait of a woman wearing a large- brimmed hat and veil, photographed at the "Sticky Backs" studio at 54 North Street, Brighton (c1910). Each "sticky back" photograph carried the studio address of 54 North Street and an identifying number. This portrait has been trimmed , but the address of the studio and the Photo No. 718 can be discerned at the top of the picture. This photograph was found with the other "Sticky Backs" photos on this webpage. It is reported that all the "Sticky Backs" photos featured on this webpage came from the same house clearance in Cheshire. Could these photos be linked to Spiridione Grossi's family ? Stella Grossi, Spiridione's sister operated a photographic studio in Birkenhead and his mother Mrs Margaret Grossi died in Birkenhead in 1932. [ABOVE] The 1913 court case against Spiridione Grossi, who was accused of abducting a 16 year old girl for "immoral purposes", was not only covered by English newspapers such as "The Times", but was also reported by press agencies across the world. The above article appeared in a New Zealand newspaper, "The Otautau Standard and Wallace County Chronicle" in May 1913. [ABOVE] A portrait of an unknown young woman taken from a postcard photograph produced at a Stickyback & Postcard Studio around 1912. 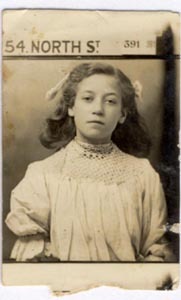 Edith Dorothy Bold, the sixteen year old girl who was taken to London by Spiridione Grossi, without her parents' consent, was eventually traced by the police "through a photograph". [ABOVE] Spiridione Grossi found "Guilty" of abducting Edith Dorothy Bold, a 16 year old Liverpool girl, as reported in "The Times" newspaper on 14th June 1913. By April 1911, Spiridione Grossi was residing in London. The census records thirty-four year old Spiridione Grossi as a patient of Dr Michael Longinotto at 10 Russell Square, London. Grossi, together two young women patients, is recorded at the home and medical practice of Dr Michael Joseph Longinotto (1869-1959), a physician and surgeon of Russell Square, later of Harley Street. Although he was a patient in the care of Dr Longinotto, Spiridione Grossi gives his occupation as "Expert Photographer". In April 1913, Spiridione Grossi was no longer working as a professional studio photographer and appears to have been concentrating on his various inventions in the field of automatic photography and electrical engineering. A newspaper article, published in May 1913, states that Spiridione Grossi had been conducting "business in automatic electrical apparatus in several places, including Liverpool, London, Manchester, Brighton, and Brussels". There is evidence from inventions patented by him in 1920 and 1921 that Spiridione Grossi was devising mechanical and electrically powered games that were then a common feature of amusement arcades. (Grossi's patented inventions describe "race games" involving "teddy bear figures climbing poles" and model horses running round a track). Although Grossi was conducting business in Liverpool, London, Manchester, Brighton, and Brussels during this period of his career, he continued to reside with his widowed mother and two younger sisters at 77 Paradise Street, Liverpool. Unfortunately, when Spiridione Grossi next gained public attention it was not for his novel inventions for amusement arcade games. On 24th April 1913, Grossi appeared at Liverpool Police Court accused of abducting a 16 year old girl "for immoral purposes". An item in The Times newspaper, published on 25th April 1913, reported that Spiridione Grossi, aged 36, had been charged with abducting a sixteen year old Liverpool girl named Edith Dorothy Bold. When Spiridione Grossi and his alleged accomplice, thirty year old Harold Krabest, appeared in a Liverpool court a week later, the prosecution claimed "there could be little doubt ...that it was the object of one or both of these men to get the girl Bold to Brussels for immoral purposes". Edith Dorothy Bold, the girl at the centre of this court drama, had just turned 16 in July 1912. 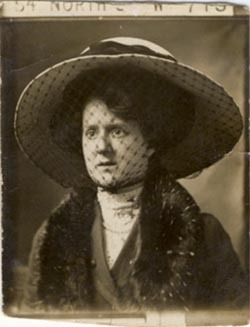 Edith Bold was described in Court as "a respectable girl - up to the events of the case", who had been employed in Liverpool as a 'blouse maker'. Edith Bold had made the acquaintance of Harold Krabest, a former ship's steward, early in 1913. A few months later, Krabest introduced the sixteen year old to Spiridione Grossi. ( According to the prosecuting counsel, Grossi had promised Krabest a sovereign for finding a girl he could take away with him to Brussels). Mr Singleton, the prosecuting counsel, told the Court that Grossi had asked Miss Bold to go with him to Brussels for 'a holiday', telling her that "she would have plenty of good clothes and a fine time". Mr Singleton read out to the Court a letter sent by Grossi to Bold, in which he wrote : "If you are sure your mother does not mind I will be very pleased to take you (to Brussels). I will pay you a pound a week. I will look well after you and buy you some good clothes, and after your holiday will bring you safely back to England". In reply, Edith had informed Grossi that she would "just love" to go to Brussels with him, but she knew that her mother would never agree to her going away and that she would "have to go without her consent". Spiridione Grossi had confided to his sister Stella that he was able to "get heaps of girls to go with me on the Continent without upsetting their parents". In Edith Bold's case, Grossi devised a story which would explain Edith's disappearance from the family home and allay any fears her parents might have about their young daughter's safety. According to Edith Bold, Spiridione Grossi dictated to her the wording of a letter to be sent to her father before she went off to London with Grossi. The letter addressed to Mr Robert Bold, the girl's father, explained that she was "going away with a dear old lady as her companion ..to a little country place in Wales". At Grossi's prompting, Edith Bold added the reassuring detail that the old lady was "very religious and I am afraid I shall differ, but will do my best". The letter suggested a response to any enquiry about Edith suddenly leaving the family home :"Father, you can tell anybody that I have a good situation and have gone away". Mr Bold was not convinced by the letter and went to the police to report that his daughter had run away, possibly in the company of an older man. On 4th April 1913, Edith Bold travelled with Grossi to London, where the pair took a single room, posing as husband and wife. The woman who ran the lodging house in Tennyson Street, Lambeth, testified that Grossi had "introduced the girl as his wife, and asked for rooms", adding that they "were going to the Continent ". The landlady testified that she had no reason to doubt that the girl was Grossi's wife : "There was nothing in the girl's behaviour to suggest the contrary. She was wearing a long coat, and appeared to be quite twenty years of age". Grossi and Edith spent two days together as man and wife. Grossi "admitted misconduct on several occasions" both at his home in Paradise Street, Liverpool, and during their stay in London, but, in his defence, he claimed that "the girl told him her age was 18". On the second day of their stay in the Lambeth lodging house, Spiridione Grossi received a telegram from his younger sister Stella, which read : "Send girl back immediately, Jacks enquiring" (It was explained that the word 'Jacks' was used as a disguised term for police detectives). Grossi realised that they could not escape together to Brussels because "detectives would be watching at the station". Fearing arrest by the police, Grossi tried to persuade Edith to travel back to Liverpool on her own. Miss Bold, "knowing she was disgraced" refused to return to her parents' home. Grossi gave Edith �3 to find a place to stay in South London, while "he went on to Brussels". 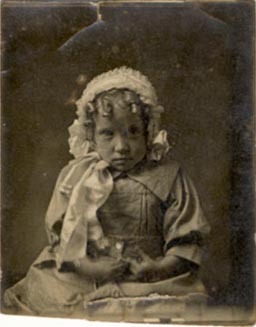 A photograph of Edith Bold was published in the national press in an attempt to discover the girl's whereabouts. Someone must have recognised Edith's face, as the police were led to her lodgings in South London. The Times reported that Edith was "ultimately traced through a photograph in a newspaper". When Spiridione Grossi returned to his mother's house in Liverpool, after his 'business trip to Brussels', he was arrested and accused of "unlawfully taking Edith Dorothy Bold, aged 16 years out of the possession of her father". Grossi was charged with the abduction of a teenage girl and his friend Harold Krabest was charged with aiding and abetting Grossi and procuring the girl for what was believed to be "immoral purposes". In his defence, Grossi said he thought "the girl was much more than 18" and his defence counsel tried to show that Edith Bold "was not of good character" and willingly went off with his client. ( In her letter to her father, which was largely prompted by Grossi, Edith Bold had written : " I am not a child...I am not one who has never seen the outside world, far from it. I know a bit more than you think I do, and I do paint my face ; it does not make me any the less honourable or respectable than you." Robert Bold, Edith's father, testified that "the great trouble he had had with his daughter was that she wanted more liberty than he was prepared to allow her", adding that "she desired to stay out too late at night". When cross-examined, Edith revealed that she had previously run away from home when she was 15"). Grossi maintained that he thought the girl was older than eighteen and that "he used every effort to induce her to return home". Although Edith Bold admitted under cross-examination that she had told Grossi she was eighteen years of age, his case was not helped by comments made in the correspondence exchanged between him and his acquaintances and a letter he had written to his sister Stella. Spiridione Grossi had boasted to his sister: " I can get hundreds of girls to go with me to the Continent". After spending the night with Edith at the house in Lambeth, Grossi wrote to Harry Krabest, (the man who had introduced him to the teenaged girl) "thanking him for a certain tip, and stating that the favourite had won by about three lengths; it was a young one, and he was coming from Monte Carlo to see it run in two months' time." ( It was explained in Court that Grossi used racing terms because he thought it "was dangerous to use girls' names in letters". The young 'favourite' mentioned by Grossi was the teenage girl Edith Bold and the reference to the race in two months' time was probably connected with Grossi's promise to take Edith to Brussels in two months when their planned 'holiday' had to be suddenly aborted). When a friend on the Continent had written to Grossi, the European contact had failed to cloak his request in racing jargon : " I hope you will bring a nice little girl with you". The fact that Grossi had sent Harry Krabest a postal order for 18 shillings, presumably as payment for finding a young girl for him to take to Brussels, suggested that the planned trip to Belgium was not an innocent 'holiday'. On 13th June 1913, at Liverpool Assizes, Harry Krabest was found "Not guilty" of procuring the girl and the charge of aiding and abetting Grossi was withdrawn by the Prosecution. The jury decided that Spiridione Grossi had unlawfully taken Edith Dorothy Bold, a girl of sixteen, "out of the possession of her father". Found "Guilty" of the abduction of a sixteen year old girl, Grossi was sentenced to "three months' imprisonment, with hard labour". After his release from prison, Spiridione Grossi returned to his mother's house at 77 Paradise Street, Liverpool. 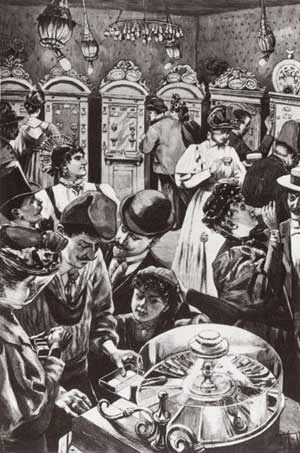 [ABOVE] Men, women and children playing mechanical games at an amusement arcade in Berlin in 1905. According to a 1913 newspaper report Spiridione Grossi conducting business in "automatic electrical apparatus" at several locations, including Liverpool, London, Manchester, Brighton, and Brussels. From around 1912 until his death in 1921,Spiridione Grossi was engaged in inventing and marketing mechanical apparatus. A newspaper report of 1913 describes Spiridione Grossi as conducting business in "automatic electrical apparatus". The "automatic electrical apparatus" was probably related to the mechanical games Grossi was devising for use in amusement arcades in places such as Liverpool, London, Manchester, Brighton, and Brussels. There is evidence from inventions patented by him in 1920 and 1921 that Spiridione Grossi was devising mechanical and electrically powered games that could be used in amusement arcades. On 20th October 1920,Spiridione Grossi, identified on the patent application as an "Engineer" of 77 Paradise Street, Liverpool, described his invention of a mechanical race game in which competing players rotated handles to move model figures along tracks or up poles [ GB Patent 172489 - Apparatus for Playing a Race Game, 28th October 1920]. In his Complete Specification of British Patent No.172489, Grossi explained the means by which the players drove teddy bear or monkey figures up a climbing pole. The novelty of Grossi's invention was that when the leading teddy bear or monkey reached the top of the pole, an electric lamp would light up to signify the winner and the other figures in the race would drop down to the starting point. Another of Grossi's inventions, involving model horses racing around a U-shaped track, was lodged at the British Patent Office around the same time. [ GB Patent 142428 - Mechanical Race Game, submitted on 9th February 1920, published on 6th May 1920]. Spiridione Grossi did not completely lose interest in photography after 1912. In May 1916, when Grossi was working as an engineer at 27 London Street, Southport, he described his invention for improving "Strip Printing Photographic Apparatus", whereby six individual portraits could be produced on a single strip of photo-paper [ GB Patent 108691 - Improvements in Strip Printing Photographic Apparatus, submitted on 15th May 1916, published on 23rd August 1917]. A report on a meeting of The Liverpool Photographic Society, published in Volume 64 of The British Journal of Photography in 1917, mentions an article entitled "Quantity Production of Photographic Prints", which described Spiridione Grossi's strip printing photographic apparatus. Although Spiridione Grossi is not listed as a studio proprietor in trade directories published after 1913, his sister Stella Marguerite Grossi (born 1883, Liverpool) was working as a professional photographer between 1912 and 1915. A Liverpool trade directory of 1913, lists Miss Stella Grossi as a photographer at 57 Bold Street, Liverpool. Kelly's Directory of Cheshire, issued for the year 1915, records Miss Stella Grossi as a photographer at 39 Grange Road West, Birkenhead. According to the FreeBMD website, Stella M. V. Grossi married William H. Huish in the district of Liverpool during the 4th Quarter of 1929. Spiridione Grossi died in Liverpool in 1921 at the age of 44. [Death registered in the district of Liverpool during the 2nd Quarter of 1921]. 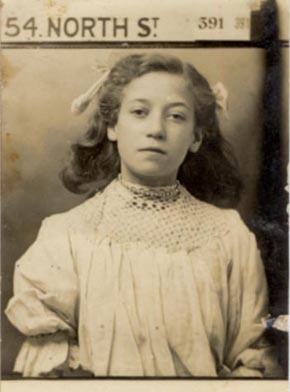 Spiridione's youngest sister Carmen Grossi (born 1888, Liverpool) died, aged 36, in the West Derby district of Liverpool in 1934. Spiridione Grossi's mother Mrs Margaret Grossi (born 1854, Liverpool) died in Birkenhead in 1932, at the age of 78. Spiridione Grossi (1877-1921) is listed as a photographer at 54 North Street, Brighton in the trades section of Kelly's 1911 Sussex Directory. When the 1913 edition of Kelly's Sussex Directory was published, Abraham H. Dudkin was shown as the proprietor of the studio at 54 North Street, Brighton. Abraham H. Dudkin was also the owner of a photographic portrait studio on the Hampshire coast at 228 Commercial Road, Portsmouth. Abraham Dudkin is listed as a photographer at 228 Commercial Road, Portsmouth in the 1915 edition of Kelly's Directory of Hampshire, but there is evidence that he had been running the Brighton and Portsmouth studios in tandem since 1912. Surviving postcard studio portraits carrying the photographer's credit Stickyback & Postcard Studios, 54 North Street, Brighton and 228 Commercial Road, Portsmouth have been found with a postmark date of 1912. Around 1913, Abraham H. Dudkin also took over a disused photographic studio at 31 West Street, Brighton. [The photographic studio at 31 West Street, Brighton, had been established in 1884 by Richard Wicks (born 1838, London), but it had not been in regular use since 1894, when the photographer Leonard Sarre (born 1842, Guernsey, Channel Islands) vacated the premises]. Abraham H. Dudkin was shown as the proprietor of the photographic studios at 54 North Street and 31 West Street, Brighton, for the next couple of years. During the period 1912-1915, Abraham H. Dudkin's firm went under the name of Stickyback & Postcard Studios, but by 1916, Dudkin's business was known as Modern Studios. The Modern Studios company retained its main studio and Head Office at 54 North Street, Brighton, but over the next few years branch studios were operating in Hove, Shoreham and London, in addition to the original studios in Brighton and Portsmouth. [ABOVE] The photographer's credit "Stickyback & Post Card Studios, 54 North Street, Brighton and 228 Commercial Road, Portsmouth, printed on the reverse of a real photograph postcard (c 1912). [ABOVE] Details of MODERN STUDIOS, the successor to the Stickyback & Post Card Studios, as printed on the reverse of a studio portrait postcard (c1916). The Head Office of Modern Studios was located at 54 North Street, Brighton, but by 1916, the company had branches in Hove, Shoreham, Portsmouth and London. 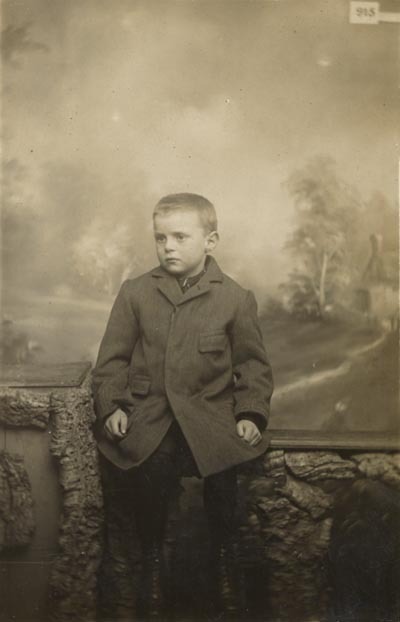 [ABOVE] A studio portrait of a young boy, photographed at the Portsmouth branch of the Stickyback & Postcard Studios (1912). The Portsmouth branch of Stickyback & Postcard Studios was located at 228 Commercial Road, Portsmouth. [ABOVE] A close-up of the studio portrait of the young boy, shown on the left. The photograph number "915"can be seen at the top right-hand corner of the picture. On the reverse of this picture postcard is a green halfpenny stamp dating from the period 1911-1912. The stamp is postmarked "PORTSMOUTH" with the date April 8th (1912?). 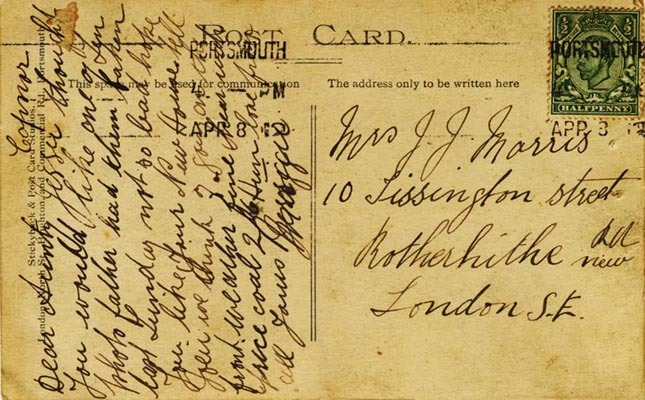 [ABOVE] The reverse of a real photograph postcard produced by the Portsmouth branch of the Stickyback & Postcard Studios at 228 Commercial Road, Portsmouth (1912). The green halfpenny stamp affixed to the card dates from the period 1911-1912. The stamp is postmarked "PORTSMOUTH" with the date April 8th (1912?). Between 1912 and 1915, Stickyback & Post Card Studios of 54 North Street, Brighton and 228 Commercial Road, Portsmouth, were owned and managed by Abraham Dudkin, a successful businessman and entrepreneur from Russia. 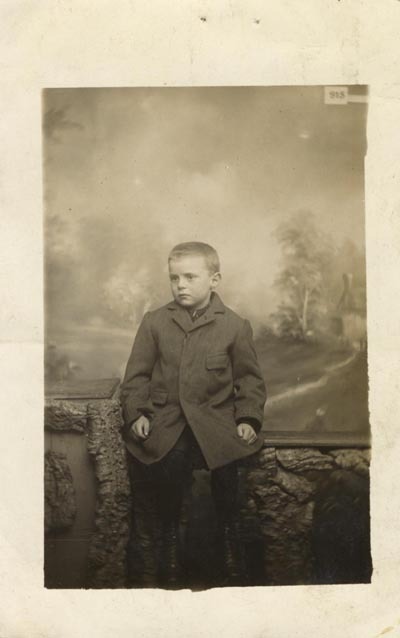 In 1915, Mordecai Dudkin, Abraham's brother, was operating a photographic portrait studio at 157a Church Road, Hove. By the following year, Abraham Dudkin and Mordecai Dudkin had combined forces to form a photography business under the name of Modern Studios. 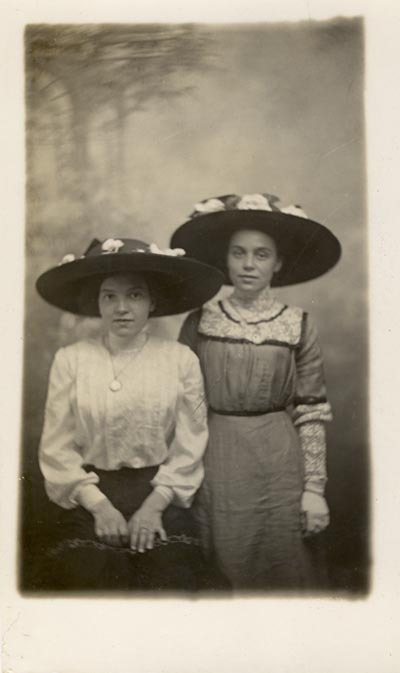 [ABOVE] A studio portrait of two young women, photographed at one of the branches of the Stickyback & Postcard Studios (c1912). The Stickyback & Postcard Studios had establishments at 54 North Street, Brighton and 228 Commercial Road, Portsmouth. 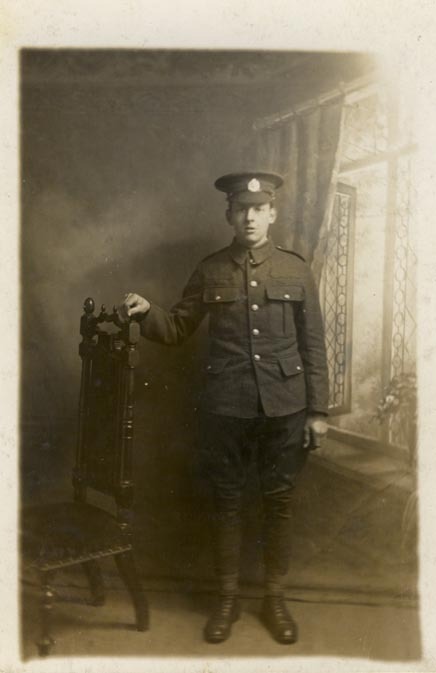 [ABOVE] A studio portrait of a soldier, photographed at one of the branches of the Stickyback & Postcard Studios (c1914). By this date, the Stickyback & Postcard Studios were being run by two Russian born photographers Abraham H. Dudkin and Mordecai Dudkin.